As managers work on finalizing the exploration roadmap for their new flagship vehicles, one of the first pieces in the puzzle – the debut of the Orion crew vehicle in space – has been given final approval by NASA. The Exploration Test Flight (EFT-1) will see Orion launched by a Della IV-Heavy from Cape Canaveral in the latter part of 2013 – or early 2014. Known previously as the Orion or Orbital Flight Test (OFT-1), the recent change of name for the test relates to Orion’s refocused role of Beyond Earth Orbit (BEO) exploration missions, which opens with the 2017 uncrewed “lap of 8” mission around the Moon. The crewed debut of Orion could occur any time between 2018 and 2021, depending on the outcome of funding projections and the ongoing roadmap evaluations, which are being worked on by a team lead by former Space Shuttle Program (SSP) manager John Shannon. 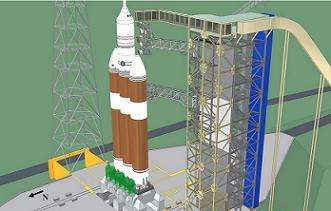 Both missions – as with all future flights – will see Orion launched on top of the Space Launch System (SLS). Given this vehicle won’t be ready until the second half of this decade, managers made an early decision to utilize the Delta IV-Heavy launch vehicle for the EFT-1 mission. Under this scenario, Lockheed Martin – who also are the main contractor for Orion – will work a deal with NASA for purchasing one Delta IV-Heavy, which will then be updated as a deal between Lockheed Martin and the United Launch Alliance (ULA). 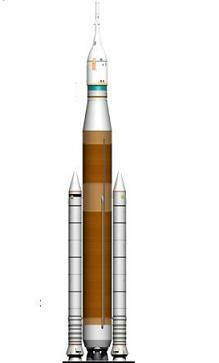 Although Lockheed Martin and Boeing make up the ULA, the joint company is the body responsible for the Delta IV-H. The contracting element should be a relatively easy part of what is now an approved mission, due to the long-term relationship NASA, Lockheed Martin and ULA have enjoyed. The future mission also confirms Orion’s transition back from the depression of Constellation’s cancellation. It was only just last year when the demise of the Constellation Program led to only a promise of job cuts and program cancellations. “Cx (Constellation) funding is being pulled back, that was going to JSC (Johnson Space Center) engineering, and being sent to Denver to support LM similar facilities/services,” noted a NASA memo at the time. However, since the unpopular FY2011 budget proposal was reversed by the approval of the 2010 Authorization Act, Orion found itself back in NASA’s future plans, with October, 2010 information first revealing Orion’s opening trip into space via Flight Test. 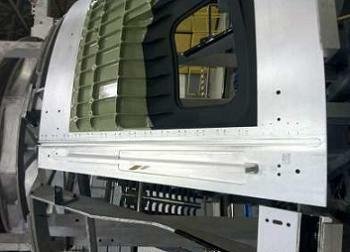 By early 2011, a Joint Test and Mission Operations Team – consisting of NASA MOD (Mission Operations Directorate) and Lockheed Martin personnel – was approved, supporting the development phase of the mission, through the real-time test flight support operation and post test flight vehicle processing. With several Orions in various stages of testing and manufacture across the States – such as the vibration testing at Lockheed Martin’s Denver facilities and the water drop tests at NASA’s Langley Flight Research Center (LaRC) – it was the welding of two panels at the Michoud Assembly Facility (MAF) in New Orleans which would prove to the a major milestone for the new vehicle. These first welds – marking the start of construction efforts on the EFT-1 Orion – were completed in September, using an innovative new friction stir welding process, developed especially for Orion construction. It was shortly after this time when further details of the make-up of the vehicle’s test objectives were revealed, with this Orion tasked with avionics tests through to heat shield and parachute performance – validating many high risk systems for the Orion spacecraft. With work pressing through to the completion of the Orion cone section welds at MAF, further refinements to the mission noted the launch date was more likely to be set in late 2013. No official launch date has been finalized at this stage, and it is unlikely to be set until after the contracting for the use of the Delta IV-H has been completed. EDIT: However, NASA since confirmed the news, citing early 2014 as the launch date.